This article is about the Seraph seen in Halo 2 and Halo 3. For Seraph model seen in Halo: Reach, Halo 4 and several other sources, see Morsam-pattern Seraph. The Kai-pattern Seraph was one of the main design patterns of the Covenant's Seraph space fighters, alongside the Morsam-pattern. The Seraph features a piscine, teardrop-like shape, fitting with the overall design elegance the Covenant is known for. Seraph fighters are mostly stored in the hangar bays of Covenant ships or stations when they are not in battle or escorting a ship. The Kai-pattern has a shield although this does not seem to always be the case. They also reinforce the craft's inertial compensators, allowing the craft to take hits that would rip other craft apart. Seraph hull plating self-repairs when damaged, adjusting to compensate for lost aerodynamic features during combat. Though not specifically intended for atmospheric use, Seraphs still are significantly faster than Banshees while flying at low altitudes. They have even been shown to fly in the hurricane-force winds of the gas giant Threshold. Seraphs are controlled via a direct neural interface with their flight harness, using minimal safety cutouts and filters. While the pilot's body is rendered immobile to reduce the risk of injury, they control the ship with their thought, much the same way as a UNSC pilot's neural interface. Unlike UNSC systems, however, this method induces significant pain called interface burn in the pilot. Elites enter a meditative state before they complete an uplink to control the pain, while Brute pilots embrace the pain to trigger their own focus. Kai-pattern Seraphs saw operational use throughout the Human-Covenant War. These starfighters provided excellent fire support to all Covenant forces in space and on the groundside. Elite pilots considered piloting a Seraph merely a means to attain enough glory to be reassigned to a ground combat position, valuing their fighters only as tools to accomplish this. Despite their extensive training, their honor code gave them a tendency to peel off from their squadrons to engage in one-on-one dogfights, making them vulnerable in combat. Brute pilots were excluded from such training, but their pack mentality and rigid social hierarchy made them far more effective teams. Human pilots soon learned to fear Brute-piloted Seraphs, identified by clan markings and Forerunner symbols carved on their hulls, more than Elite-piloted Seraphs. Kai-patern Seraphs were prominently used during Operation: WARM BLANKET, the Battle of Earth. During the Battle of the Threshold gas mine, Sesa 'Refumee tried to escape on a Seraph. However, he was killed by Arbiter Thel 'Vadam before he could. During the Battle of Installation 00, the Prophet of Truth's fleet deployed numerous Seraphs against the UNSC/Sangheili fleet in an effort to stop them from landing ground forces on the Ark. The Seraphs shot down a few Pelicans, but could not stop the others from breaking through. The Seraphs were presumably destroyed along with the rest of the Covenant fleet. 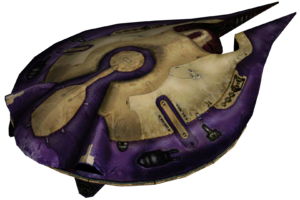 The Seraph is actually an old model of a Covenant tank that Shi Kai Wang created. In the Halo Legends episode The Package, when Kelly-087 yells "Seraph formation! ", the subtitles mistakenly say, "Syrup formation!" An overview of the Type-31 Kai-pattern "Seraph". An alternate in-game overview of the Seraph from Halo 2. Views of the Seraph in Halo 2. A Seraph docked inside the Threshold gas mine. Overview of the Seraph in Halo 3. A render of a Seraph for Halo 2: Anniversary. Separatist Seraph fighters engaging loyalist Seraph fighters over Installation 00. The Seraph fighter docked within the Threshold gas mine, as seen in Halo 2 Anniversary. A frontal view of the Seraph fighter aboard the gas mine.